Nestled beachfront, on the western shore of the Gulf of Siam and conveniently located together in the same complex with the Blue Lagoon Resort, is one of the newest beachside holiday resort hotels in Thailand, Sheraton Hua Hin Resort & Spa. Combining the comfort and tranquility of historic Hua Hin, the resort offers boundless ocean views, memorable sunsets, warm Thai hospitality, and the finest in five-star comfort. Although Blue Lagoon and Sheraton Hotel are both different establishments, providing different types of room accommodations, all Blue Lagoon Resort guests are encouraged to use all Sheratons facilities and enjoy special discounts on all facilities with the Sheraton Privilege Card, including discounts on all food and beverages. 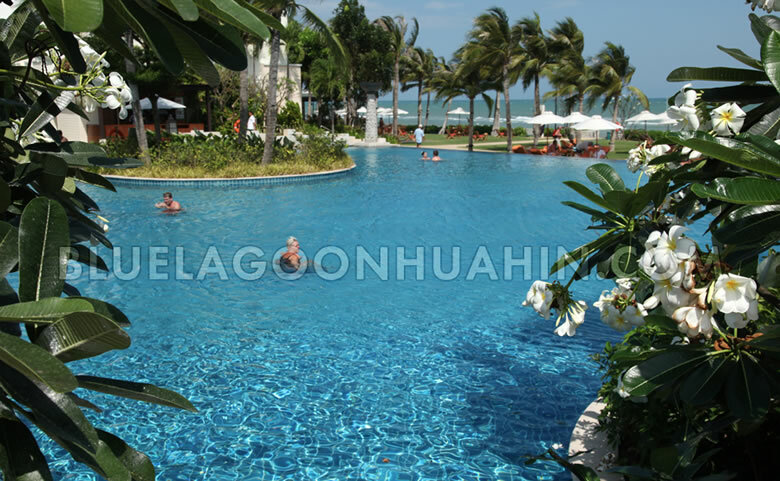 Guests of Blue Lagoon Resort may use the Sheraton Hotel facilities under normal conditions. When the Sheraton Hotel is fully occupied or during any special hotel occassions, use of the facilities may not be permitted. Whether you are sipping a cocktail on your private terrace or chilling out in one of the two endless lagoon style swimming pools that meander through tropical landscaped gardens, you are sure to experience total rest and relaxation.